Only two can keep a secret if one of them is dead. It’s said that the only people who really know what goes on in a marriage are the couple themselves. But what if even they don’t know the truth? David and Adele seem like the ideal pair. He’s a successful psychiatrist, she is his picture-perfect wife who adores him. But why is he so controlling? And why is she keeping things hidden? There was a lot of chatter about this book around the New Year, when it first came out, particularly about the 'shock ending' that left readers reeling. I've enjoyed Sarah Pinborough's writing in the past - she's a really good author - but approached this one with some trepidation, due to so much of the marketing focus being on #wtfthatending. I hoped it would be a tale of more than just a big twist. I needn't have worried. Pinborough has a knack for creating characters with depth and complexity, who even if they're unlikable in many ways, compel you to keep turning the pages and find out just what is going on with their lives. She's also very good at crafting a nagging sense of unease, like something bad is hovering just offscreen, setting the reader's mind whirring as to what it might be, when it might show itself, and what chaos that might unleash. Suspense of the highest order. 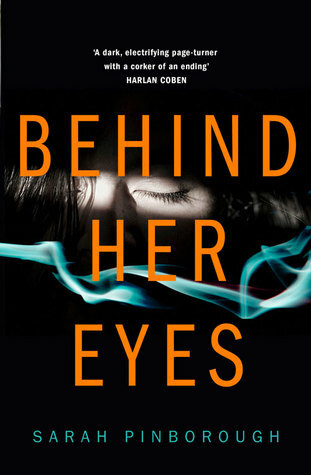 Behind Her Eyes is a very interesting read. Pinborough has a smooth style that beckons you in and keeps you firmly planted on your seat (and often it's edge). She will make you think, and also make you feel. There were many times I wanted to yell at or shake various characters - but rather than that being a bad thing, it's a sign of great writing. Pinborough cleverly plays puppetmaster, but the cast of characters never feel like caricatures. They're all very human, very flawed (very very in some cases), people who make plenty of mistakes in their choices, but for valid reasons. Who have blindspots, even when they're otherwise smart and intelligent. At times I felt like rolling my eyes and going 'really, how can you not see that? ', or 'seriously, your believing that person without question? ', before remembering that I was getting an overview the character wasn't - and that there are times in my own life I've been so caught up in something I've failed to see what might seem obvious to others. That's one of the beauties of Pinborough's storytelling, the everyday humanity of her characters (even those who might have performed unspeakable acts). Different readers might find themselves siding with different characters throughout, but almost always there's a sense that you can see the reasoning for the actions and choices of 'the other side' too, so end up empathizing if not agreeing. It all builds and builds to a terrific denouement. There were several times throughout the novel that I thought I'd cracked what various upcoming twists might be, but that didn't puncture my enjoyment, and in fact only made things even more compelling. In any case, Pinborough had so many different ideas spiralling around in my head as the tale dipped, dodged, ducked and dived that even if I had nailed things absolutely (which I didn't), I could only have said 'oh yeah, that crossed my mind', rather than having truly and completely picked the ending. More importantly, even if you're sure you can see what's coming, Pinborough adds in some swerves and wrinkles, and it's all delivered in such a way to leave readers delighted and shocked, regardless. A very fine tale from a very fine author.